As you begin to venture back home for the holidays, you quickly realize it often takes forever to get anywhere in this humongous country called America. We got Jalopnik readers to share the ten best games you can play to keep your sanity while you're eating up the interstate. What&apos;s the most entertaining road-trip game? 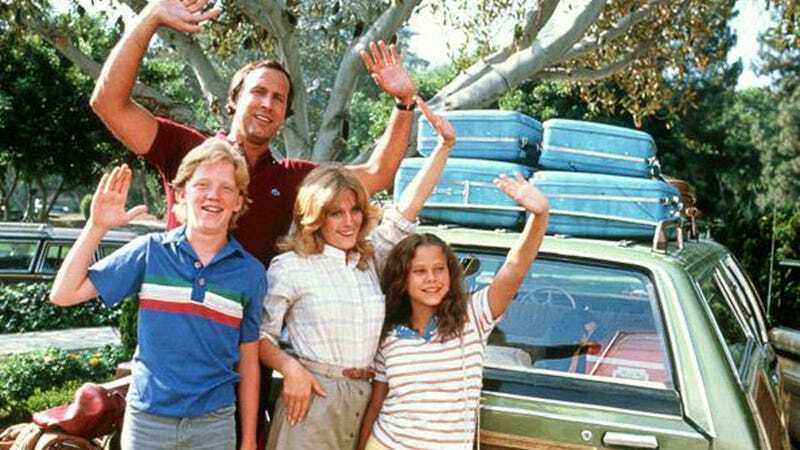 Photo Credit: National Lampoon's Vacation, Warner Bros. It consists of you melding two (or more) media titles together to form a new title, as well as a plot. Your comrades try and guess the title after you describe this new puzzling plot to them. A world of apocalyptic appeal is created after creatures begin wreaking havoc on the world's major cities, though one man gets away from it all by building past times in his very own back yard. How to Play: When you go onto a bridge or into a tunnel, you hold your breath. This game works best for passengers, is particularly challenging for driving in and out of San Francisco, and should generally be avoided by motorcyclists. How to Play: See as many states as possible and the farther away the state, the better. It's like old-school Pokemon; gotta catch ‘em all! Everyone playing keeps his/her eyes peeled for horses, they can be real horses, or pictures, sculptures, etc. and they need to be outside of the car. When you see a horse you yell 'My horse(s)' each horse is 1 point. Everyone is also on the hunt for graveyards. When a graveyard is seen you yell 'Graveyard', the person who yells graveyard keeps his/her horse tally, all others lose their hose tally. Person with the highest horse tally at the end of the trip wins. In the city it's called "my prostitutes," except when you pass the policeman the same thing happens when you pass a graveyard. The prostitutes can be interchanged with drug dealers. Depends on what city you're in. How to Play: Try and identify a car up ahead only by its headlights or taillights depending on what side of the road the other car is on. The first person to identify the car wins. Can be played day or night and is particularly useful in training yourself to spot cop cars from half a mile away. How to Play: Your GPS will tell you at the start of a trip how long it will take to get there. Your goal is to beat that time by at least an hour. You get demerit points for every speeding ticket you get. Also known as the "It says it should take 14 hours to get there but let's try to get there in 10 with food and fuel stops" game. Any time someone see a car with a headlight out, everyone punches the roof. The last person to do so has to strip off a piece of clothing. If you were the first person to hit the roof, you can put a piece of clothing back on, or have someone else put a piece of clothing back on. The game is best played without your grandma in the car. How to Play: You have to spot the whole alphabet, in order, using only signage that is outside the car. First to finish wins. Writing on other vehicles is not allowed. You start with the letter A and you try to spot a make or model that begins with it (ex. Acura), then you move on the next letter. (Bronco, Colorado, Dodge...) So on, and so forth. Whoever gets to Z first, wins. How to Play: Every time you see a VW Beetle, you yell "Slug Bug" (or "Punch Buggy"). Then you punch somebody. You have to call out the color of the Volkswagen or else people will say it didn't count. If you call "no punch backs," you will get indignant when you get punched anyway. One side takes the left hand side of the road, the other the right. You get points for spotting the number of legs in a pub name. The big score for any seasoned Legs players is a pub in Stalybridge called The Old Thirteenth Cheshire Astley Volunteer Rifleman Corps Inn - officially adjudicated to be worth a hundred. It's been known for serious players to make a detour of fifty miles to bag it for their team.